In response to 2016 in photos: For photos, memes, and perhaps other quick notes sent from my mobile device or written on the fly during 2016. Random poetry: a BASIC random primer and a READ/DATA/STRINGS primer, for the TRS-80 Model 100. I’ve managed to refine my primitive Linux data transfer script into a script that I use nearly every day to transfer files to and from my Model 100/200. This script is basically just a very simple BBS, for transferring data to and from a Model 100/200 over an RS232 serial connection. 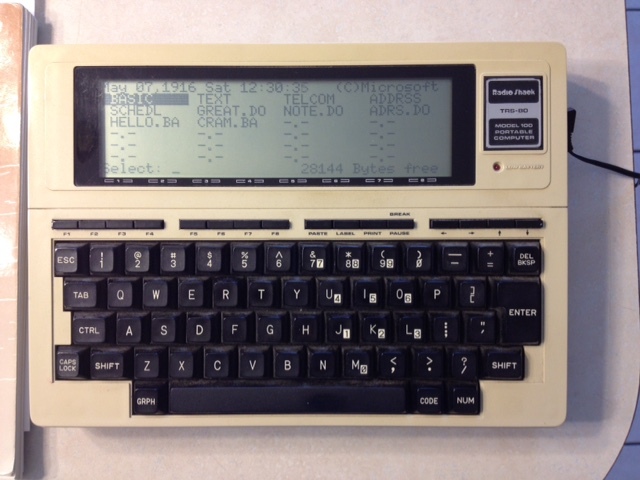 The TRS-80 Model 100 and Model 200 were very early laptop computers that saved automatically, had networking built-in, and lasted for nearly a day on easily replaceable batteries. Model 100 from 1916 last modified May 10th, 2016.